1. From the Association level of SportsTG Membership, click on the Configuration icon and select Settings. 2. Under 'Set Up Registrations', click on Age Groups. 3. A list of existing Age Groups will appear. The 'Added By' column indicates whether the age group was created by the National Body or the Association. 4. To add a new Age Group, click on Add in the top right corner. 5. The 'Add New Age Group' screen will appear. 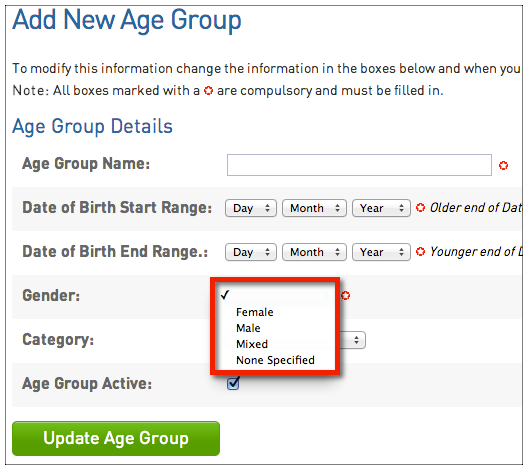 Type the name of the Age Group in the 'Age Group Name' field. 6. Enter the Date of Birth (DOB) range for the age group. For example, if the Age Group is 30 - 39 year olds for the 2013 season, the DOB start date will be 1 January 1974 and the DOB end date will be 31 Jan 1983. All members registered to the 2013 season (manually by the administrator or via the online registration form) with a date of birth within this date range will be automatically allocated to the 30 - 39 age group. 7. Select a gender from the 'Gender' drop-down list (compulsory). 8. Click on Update Age Group. 9. A confirmation message will appear - 'Record Updated Successfully'. Click on the Click here link to return to the list of Age Groups. 10. You will be returned to the list of Age Groups which will show the newly created Age Group.